Queen opens new Heathrow Terminal 2 Jump to media player The Queen has officially opened the new £2.5bn Terminal 2 building at Heathrow Airport in west London. Thousands mark Queen's birthday Jump to media player Thousands gathered in London for the annual Trooping the Colour ceremony to mark the Queen's official birthday. Thrones star pig farm revelation Jump to media player Game of Thrones star Maisie Williams returns to her home village of Clutton in Somerset. Game of Thrones boost to economy Jump to media player Fantasy drama series Game of Thrones is providing an unexpected economic boost in Northern Ireland. Game of Thrones premieres in NY Jump to media player The cast of Game of Thrones attend the New York premiere for the fourth season of the show. 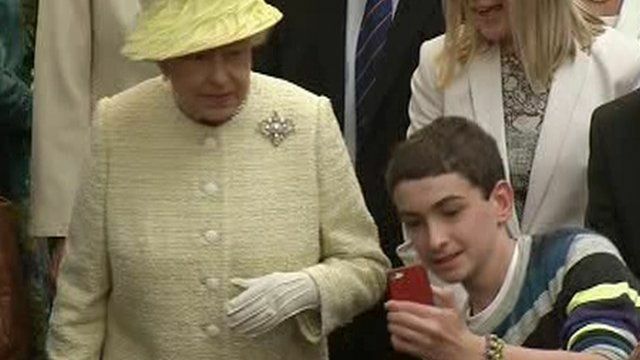 The Queen became an unexpected subject for a selfie as an enthusiastic boy managed to grab a photo with the Queen in the background as she passed by. Her Majesty looked on bewildered after being photographed during a tour of Belfast's St George's Market. The Royal couple are currently on a three-day visit to Northern Ireland.